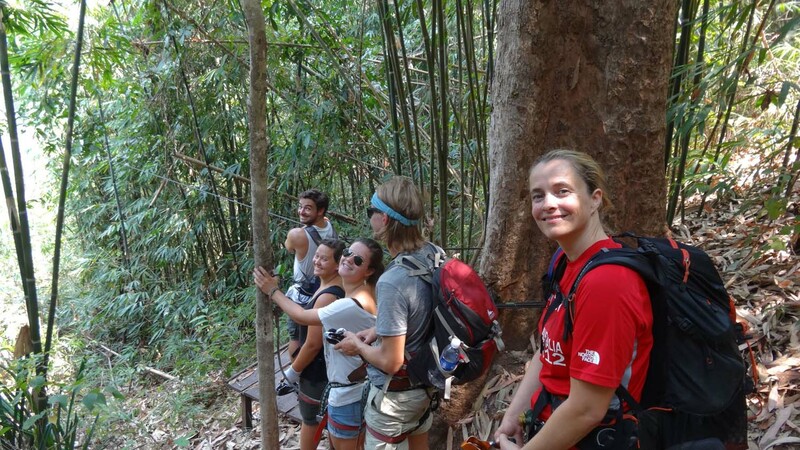 We didn’t book it, but were lucky to get the last 2 spots on the 2 day – 1 night gibbon experience. We arrived early at the office to see if they had any places left as the evening before they had closed early for Lao new year. A mad run around getting it all sorted, but we managed to finish it all and only keep our new friends waiting a few minutes. Jon missed the safety video and came running in just after the 3 day – 2 night group had jumped into their pick up truck. Our pick up truck took us to a tiny village on the main road where we were given our hornets (harnesses pronounced the Lao way!) with zip-lining device and a few minutes later we flew across a river on our first zip line. It was a short one, but we loved it! 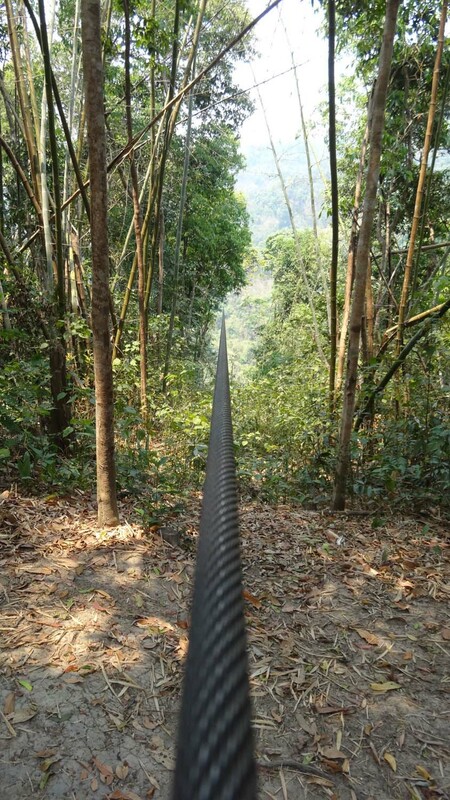 And luckily for us this was the first of many, much longer zip lines. 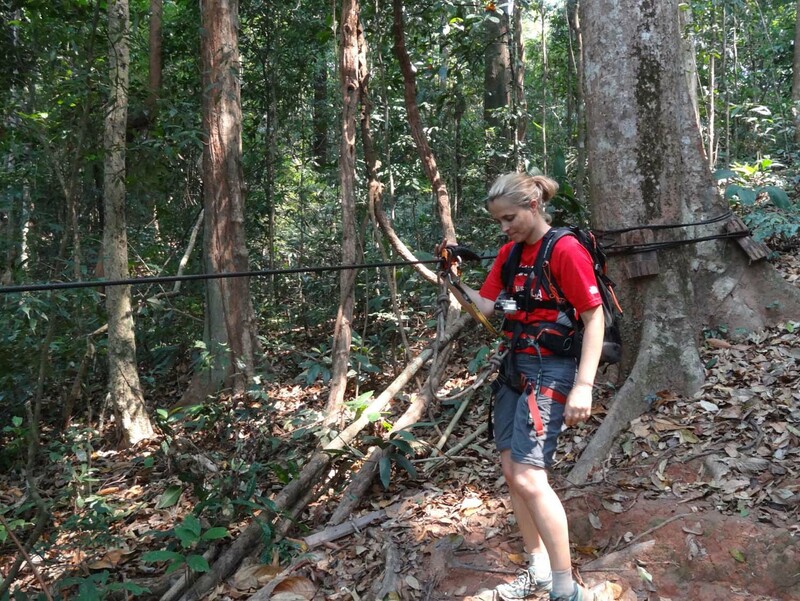 After a 2 hour hike, mainly uphill, we arrive at our first longer zip line. This is even more fun!! And for the next few hours we fly through and over the forest, enjoying the views as we zoom high above valley floors and right past giant trees. It gives you an amazing rush and fantastic feeling of being alive. 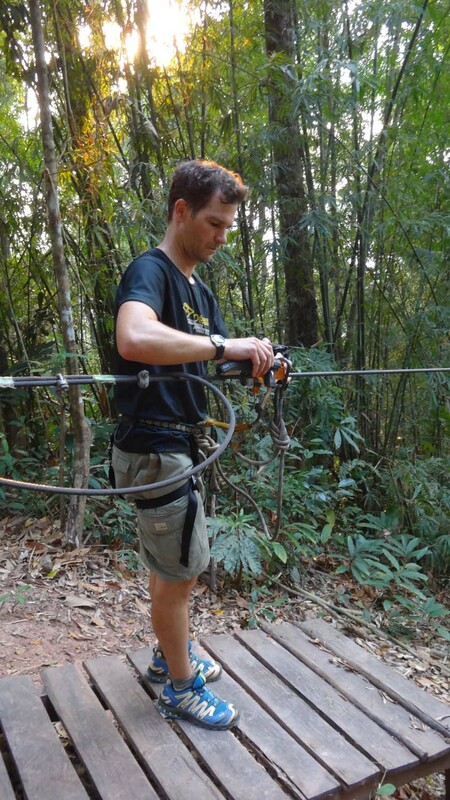 Jon on a long zipline, the longest is 700m! 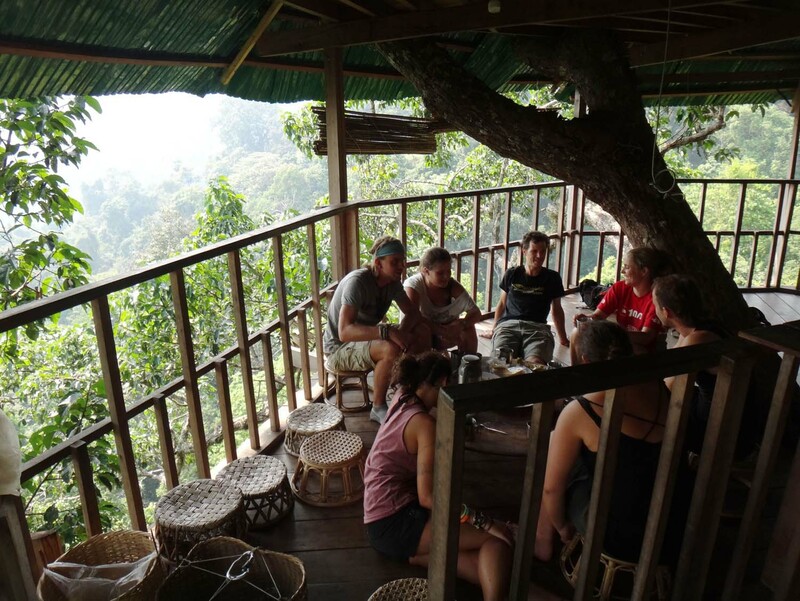 We zip line all the way to our tree house where we stop for an afternoon cuppa and a rest, before our guides pick us up again at 4PM for some more zip lining. 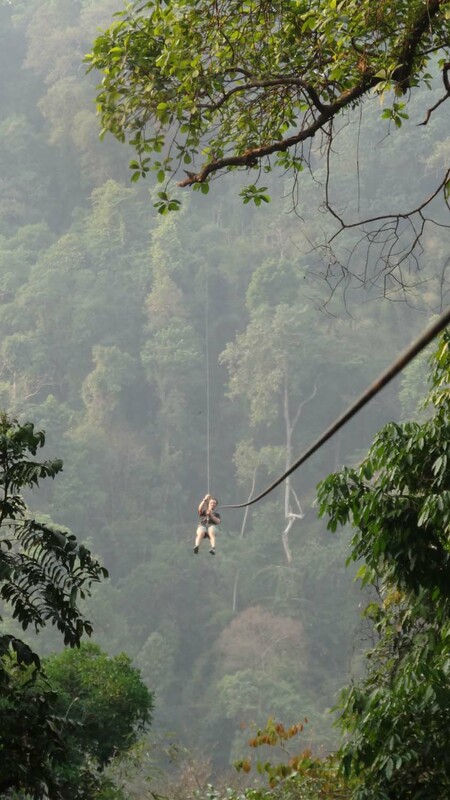 We fly out of our tree house (this must be one of the best ways of arriving at and leaving your house) and the guys show us a loop of 2 long ziplines across one valley. All you have to do is walk a few minutes in between the 2 and you can fly around and around across that valley floor forever. This is brilliant! Check out the video Monkeys on a Line if you want to see what it feels like to fly over and through the trees yourself. sooo much fun!! and yes, that is another zipline in the background! After nearly 2 hours of fun we go back to the tree house where we all have a shower with an amazing view before a great dinner. As night falls we watch a beautiful, but smokey sunset over the mountains before the stories and riddles come out. The next day it is all repeated again. 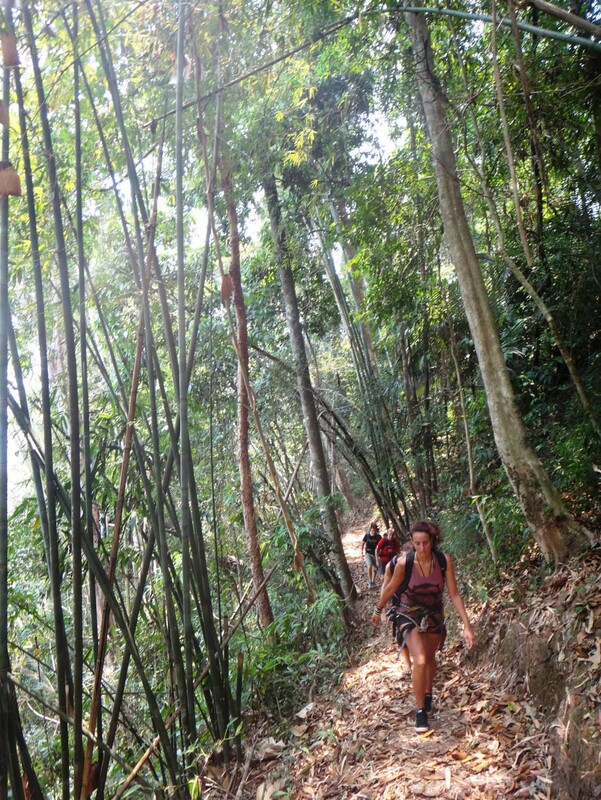 We fly through and above the forest before breakfast, relax and then a combination of hiking / zip-lining back to the pick-up truck where we find cold beers in a makeshift fridge. After a cold beer we jump in for a swim before heading back to Huay Xai on the rough and bumpy 4wd track. A brilliant way to spend 2 days with some other crazy people who were up for some fun for sure! 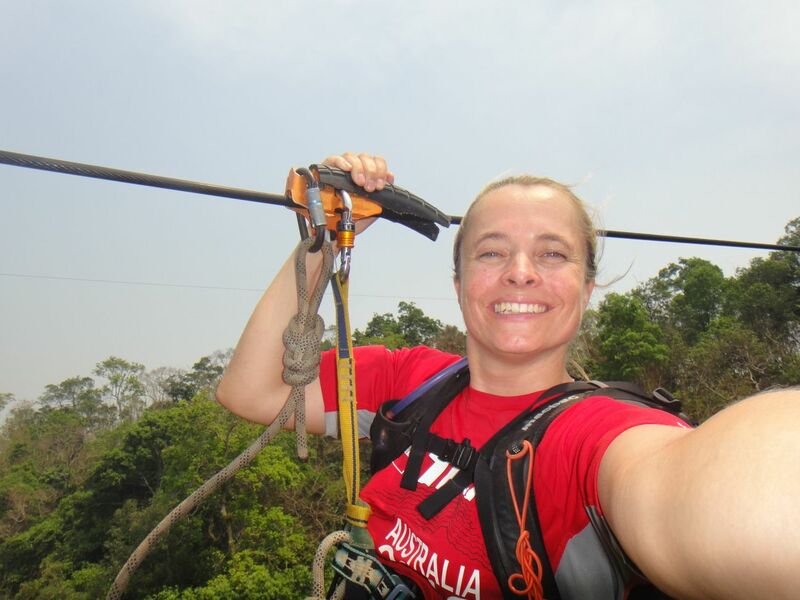 I admire your bravery – did you check out the safety certificates before risking your necks on those wires? I guess you never did see any real Gibbons? 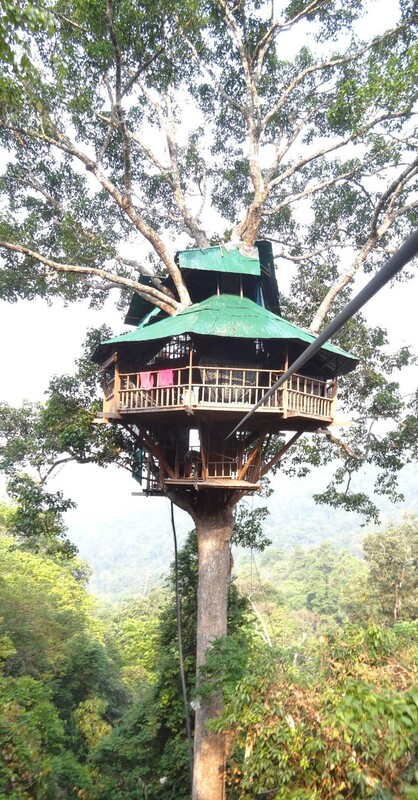 Sounds like great fun – a real life ammusement park ride in the real jungle. 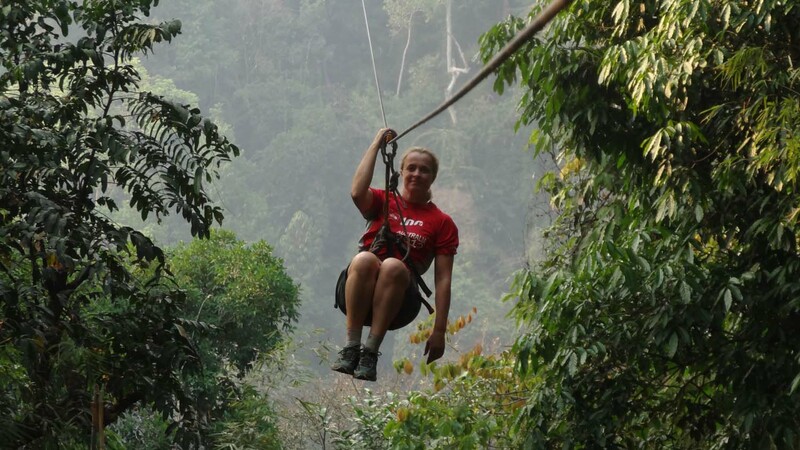 We did see gibbons in a national park (in Thailand), but not whilst flying around on zip lines. Safety certificates? What are they? 🙂 it was so much fun! I want some in my backyard!!! Coming to visit us in Borat country?! It was awesome!! And it happened a few times we had to pull ourselves the last 2 or 3 meters. Pretty easy luckily! You guys would all love it I’m sure!! Not bad for someone who doesn’t like heights Jon. I thought I’d see Lara on a zip-line before you. Keep up the good work guys. That looks awesome. I get so excited when I see a travel update. Then I spend the next half an hour jealous. Why don’t you join the adventure for a bit? !